The San Diego Supercomputer Center (SDSC) at the University of California San Diego has received two key HPCwire annual awards for 2018, recognizing the use of its Comet supercomputer in assisting scientists in finding the first evidence of a source of high-energy cosmic neutrinos, and for Comet’s role in a recent autism study led by a team of researchers at the university’s School of Medicine. Editors’ Choice for the Top High-Performance Computing (HPC)-Enabled Scientific Achievement, for Comet’s role in assisting an international team of scientists at the National Science Foundation (NSF)-funded IceCube Neutrino Observatory in finding the first evidence of a source of high-energy cosmic neutrinos. Editors’ Choice for Best Use of High-Performance Computing in the Life Sciences, recognizing Comet’s use in new findings related to autism spectrum disorder (ASD). The new study was published in the online edition of the April 20, 2018 issue of the journal Science. 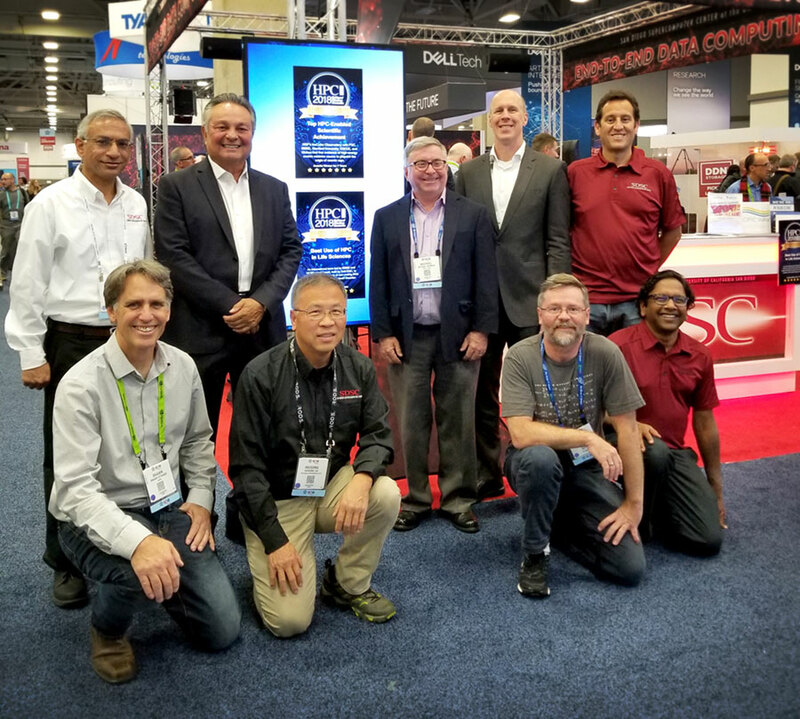 This year’s awards were presented by HPCwire at the 2018 International Conference for High Performance Computing, Networking, Storage and Analysis (SC18), in Dallas, TX. SDSC shared this award with several other organizations, including the NSF’s IceCube Neutrino Observatory and its eXtreme Science and Engineering Discovery Environment (XSEDE), as well as Stanford University, the Pittsburgh Supercomputing Center, and Globus, a research data management service. Comet was also used in the verification and analysis of last year’s landmark discovery of gravitational and light waves generated by the collision of two neutron stars eons ago. That discovery, made by researchers at the NSF’s Laser Interferometer Gravitational Wave Observatory (LIGO), earned three researchers the 2017 Nobel Prize in Physics for their detection of gravitational waves in the universe as hypothesized by Albert Einstein in 1915. SDSC’s Comet was one of several HPC systems used to confirm the newest finding as well as the initial discovery. As before, LIGO researchers benefited from high-throughput computing via Comet and the Open Science Grid, a multi-disciplinary research partnership specializing in large-scale computing services funded by the U.S. Department of Energy and the NSF. Through a partnership with XSEDE, OSG scientists have access to resources such as Comet to further their research. The integration of Comet into the OSG provisioning system was led by a team including Frank Würthwein, SDSC’s lead for distributed high-throughput computing and an expert in experimental particle physics and advanced computation. Würthwein also serves as OSG’s Executive Director. HPCwire’s ‘Best Use of High-Performance Computing in the Life Sciences’ award for 2018 is for recent findings related to ASD. While researchers established earlier that de novo mutations contribute to approximately one-third of cases of ASD, they identified a culprit that differs from previously known genetic causes of autism. “For ten years we’ve known that the genetic causes of autism consist partly of de novo mutations in the protein sequences of genes. However, gene sequences represent only 2 percent of the genome,” said Jonathan Sebat, a professor of psychiatry, cellular and molecular medicine and pediatrics at UC San Diego School of Medicine, and head of the Beyster Center for Molecular Genomics of Neuropsychiatric Diseases. To investigate the other 98 percent of the genome in ASD, Sebat and his colleagues analyzed the complete genomes of 9,274 subjects from 2,600 families. One thousand were sequenced at Human Longevity Inc. (HLI) and at Illumina Inc., and DNA sequences were analyzed using Comet with the assistance of SDSC Distinguished Scientist Wayne Pfeiffer and SDSC Bioinformatics Programmer Analyst Madhusudan Gujral, who is also a co-author of the paper. With Comet’s 1,984 compute nodes at the time of the research, along with several petabytes of scratch space for analysis, tens of genomes could be processed simultaneously, according to Pfeiffer. “Instead of months, with Comet we were able to complete the data processing in weeks,” he said. “Whole genome sequence data processing and analysis are both computationally and resource intensive,” noted Gujral. In 2017, SDSC received an HPCwire’s Editors' Choice for Best Use of HPC in the Life Sciences for Comet’s role in research that identified structural changes activating the gene-splicing technology called CRISPR-Cas9. The annual HPCwire Readers’ and Editors’ Choice Awards are determined through a nomination and voting process with the global HPCwire community, as well as selections from the HPCwire editors. More information on these awards can be found at the HPCwire website or on Twitter through the following hashtag: #HPCwireAwards.